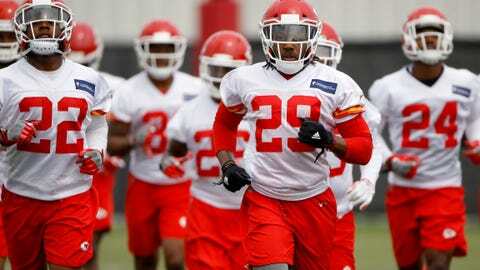 Eric Berry (29) and the Chiefs worked hard in organized team activities. KANSAS CITY, Mo. — Chiefs coach Andy Reid and quarterback Patrick Mahomes II finally had a disagreement. After calling off the final day of a mandatory three-day minicamp because of temperatures that were expected to hit triple digits, Reid breezed through the typical wrap-up questions from reporters. A few minutes later, his new quarterback stood before reporters and answered a similar barrage of questions. And Mahomes, too, was also asked how long he intends to break before getting back to work. So one day for Reid. Two days for Mahomes. It might be the first time since the Chiefs traded up to select Mahomes with the 10th overall pick in last year’s draft that he and his coach have had a difference in approaches. The two otherwise have been in lock-step, their words and actions nearly identical, whether in the meeting room or on the practice field. It’s the biggest reason the Chiefs were so comfortable trading Alex Smith to the Washington Redskins after his Pro Bowl season, the best of his entire career, and happy to put the hopes of the franchise on the shoulders of a 22-year-old with one NFL start. In all, Reid was pleased with the work the entire team put in during its offseason program. One year after he claimed to be “pummeled” by questions about some of his biggest stars skipping out on voluntary workouts, Reid had perfect attendance during organized team activities. Even players who were recovering from injury or surgery were doing so at the Chiefs’ practice facility, creating what Reid hopes is a sense of cohesiveness even before the team heads to St. Joseph, Missouri, next month. Good thing, too. There will be plenty of jobs up for grabs at training camp. “Just the fact that guys were here, you start kind of building that team thing,” Reid said. That includes finding a backup for Reid’s new starting quarterback. Mahomes is the only quarterback on the roster who was part of the team last season, putting him in an even more unique situation. But the Chiefs signed veterans Chad Henne and Matt McGloin along with undrafted free agent Chase Litton from Marshall, and they’ll compete this fall for the backup jobs. Indeed, there appeared to be a more relaxed vibe around the Chiefs this offseason, as if the roster turnover that sent some long-tenured veterans away and brought an influx of youth changed the atmosphere. Not a laissez-faire attitude, though. More like a confident and efficient one. So when Reid arrived at the practice facility Thursday, he took stock of a forecast calling for sunny skies and temperatures in the 90s. He considered the fact that the final day of minicamp is usually a light workout anyway, and that his guys had worked hard over the past few weeks. Then he decided to release them early, confident that they’ll be ready for training camp. Even if they take more than one or two days off.